Back in the mid 1960’s Canada was a minnow in the international sports landscape. At the 1960 and 1964 Olympic Summer Games, Canadian athletes won a grand total of five medals total. Even our beloved hockey teams were struggling internationally. Our best professional players were not allowed to participate at the Olympics and they didn’t compete at the world championships. The world juniors and women’s worlds didn’t exist. Yes, there wasn’t much to cheer about for Canadians at big international sports events. That is until a 15-year-old swimming sensation from Vancouver called Elaine Tanner appeared on the scene. She wowed Canadians with her incredible athletic exploits and won their hearts with her uniquely Canadian charm. These powerful moments will continue to mark Canadian sport history. In 1966, Tanner showed Canadians why international sport and pride in your country is so important. And it seems our world sports stature has been on a steady climb ever since. At the Commonwealth Games that year in Jamaica she won four gold medals –including world marks in the 200-metre butterfly and 400-metre individual medley- and three silver. She was the first quadruple female Commonwealth Games champion. She won the Lou Marsh Award as Canada’s athlete of the year, still the youngest recipient in history. A year later at the Pan American Games in Winnipeg, she showed her success was no fluke. Tanner won gold in the 100 and 200 backstroke, both in world record time, and added three silver medals. Canadian pride swelled even more when “Mighty Mouse” a nickname to describe her fierce competitiveness, stepped on the podium three times at the 1968 Olympics in Mexico. The medals were silver in the 100 and 200 backstroke and bronze in the 4X100 freestyle relay. It was more than half of Canada’s total at the Games. Tanner retired from swimming after the Games. It was said that Elaine Tanner made one of the biggest impacts in the water of any Canadian swimmer ever. She was made an officer of the Order of Canada in 1969 and was inducted into Canada’s Sports Hall of Fame in 1971. In all, the 17-time national champion has been inducted into seven Halls of Fame. The Elaine Tanner Award is presented annually to Canada’s junior female athlete of the year at the Canadian Sport Awards. 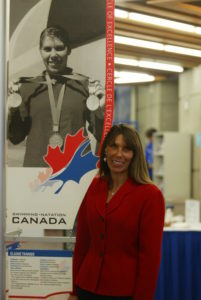 She received a Diploma from the Department of Kinesiology at Simon Fraser University in 1986 with First Class Honors majoring in Fitness and Health. She expanded her studies in natural health in the 1990’s and earned a Diploma as a Holistic Health Counselor Certified by the American Society of Alternative Therapists in Massachusetts. She currently lives with her husband John Watt in Oakville, O.N.